Credit card debt is the third largest source of household indebtedness. 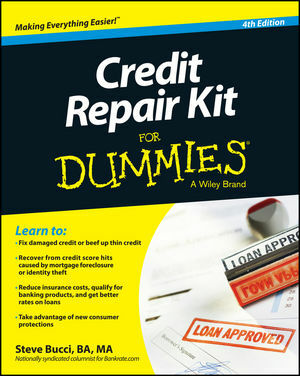 Credit Repair Kit For Dummies gives you the tools you need to repair your credit. This new edition covers: major changes with the Consumer Financial Protection Bureau's (CFPB) inquiry into overdraft practices and their effect on consumers; dealing with the effect of tightened credit markets on those with good, marginal, or bad credit; best ways to recover from mortgage related score hits or minimize damage after walking away from a home; updated Vantage Score information; updated coverage on reporting programs like FICO Score watch, etc. ; what makes a good FICO score today; a new section on significant others (boyfriend/girlfriend/spouse) and credit/debt sharing; Debt Relief Act in a mortgage meltdown situation; the latest tips and advice on dealing with identity theft and annoying collection calls; and more. Online you'll find sample credit reports, forms, templates, and other helpful tools to help whip your credit into shape. If you have mediocre credit and want or need to better manage it in order to get a job, reduce insurance costs, qualify for banking products, and more, Credit Repair Kit For Dummies has it covered. Steve Bucci, BA, MA, is a personal finance expert and a nationally syndicated columnist whose column is carried by the financial megasite Bankrate.com and the Scripps Howard News Service.